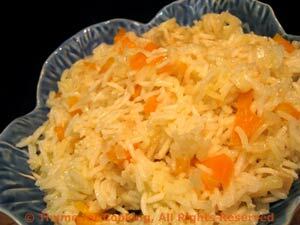 Basmati Rice Pilaf, Thyme for Cooking healthy gourmet side dish. I'm not sure of the proper definition of a 'Pilaf' but adding a bit of carrot, onion and celery can turn simple rice into a colorful, elegant side dish. Finely chop onion, celery and carrot. Add onion, carrot and celery and sauté about 3 minutes, or until softened. Add rice and sauté, stirring for 2 - 3 minutes longer.